History is rich with the food of the poor. The recipes that arose out of exigency are pragmatic, judicious and, very often, deeply delicious. Nothing satisfies me more than taking the most simple and inexpensive foods and coaxing unexpected flavor from them. The first half of season 2 of PBS’ stellar series, Mind of A Chef, focuses on Chef Sean Brock as he guides viewers through some powerfully deliciousness food memories from his childhood in Appalachia. Chef Brock, along with Glenn Roberts from Anson Mills, are almost single handedly responsible for reviving near extinct varieties of grains, rice and beans. He is someone I deeply respect. So when he says something is delicious, I believe him. And so I set out to transform my humble green beans into umami bombs of faux-beefiness. I went searching for a scientific explanation that would account for the creation of flavors that result from this drying process. But, I came up short. I found nothing. Most beans that we eat are first dried. And they are delicious, but they taste….like beans. 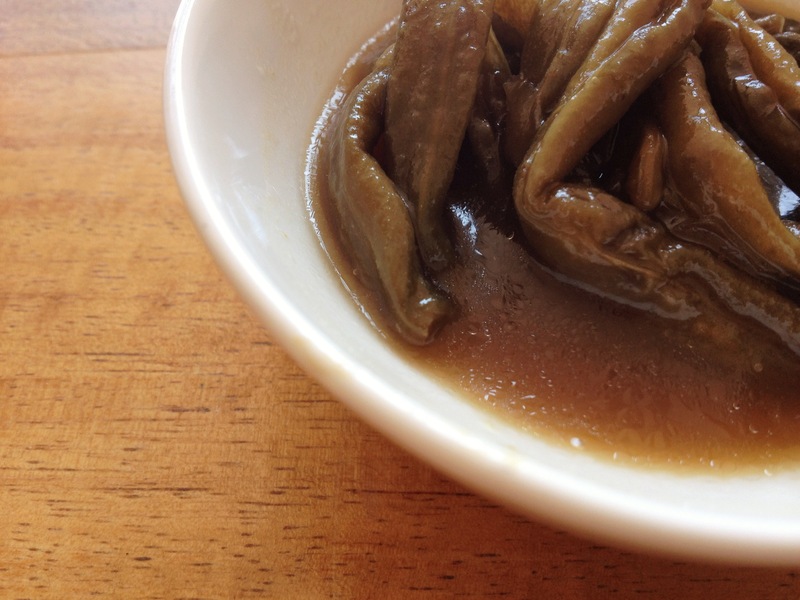 Why does drying green beans this way yield such a deep, rich flavor? That is a good question. And I don’t have an answer. I had successfully strung my beans and they’d dried evenly and thoroughly, but halfway through cooking them, I thought I’d made a terrible mistake. Frankly, they didn’t taste like much. I did my best to couch my disappointment and soldier on, and I am glad I did. As Sean Brock said, the flavor magic is in the potlikker, the reduced cooking liquid left in the bottom of the pot. Once I had cooked down the liquid far enough and mixed the beans back in, the magic of the Leather Britches revealed themselves to me. God’s honest truth: one of the best things I’ve ever eaten. note: I read lots of descriptions about how to cook these beans, and like all good recipes handed down from grandma, there lacked a certain specificity. The suggested cooking times ranged from “hours” to “forever”. Take that to mean what you will- degree of doneness is a matter of taste. I cooked my beans for about an hour and 15 minutes, then removed them from the pot while I reduced down my potlikker. 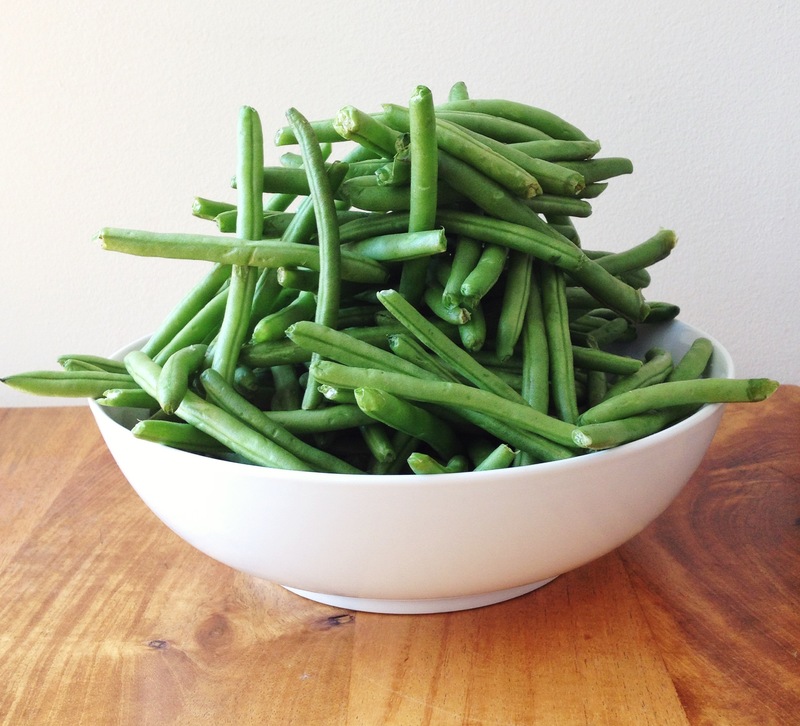 2.String Beans– take a darning needle and thread it with string. Pierce the first bean through the middle and tie it off securely. String up the remaining beans, sticking the needle through the middle of each bean. (Once my string of beans was about an arm’s length long, I started another string. I had three strings, in total). 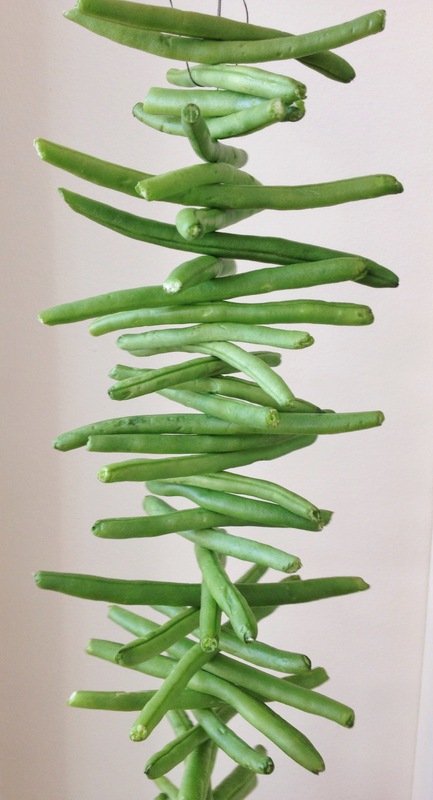 3.Dry beans– hang your beans to dry. Apparently, back porches are a favorite leather britches drying spot. A less charming, but equally good spot, would be tying them to your kitchen cabinets (which is what I did). Leave your beans until they are fully void of all moisture. This should take at least a few weeks. It will vary depending on air circulation and light, etc. Mine took about 2 1/2 weeks to fully dry out. 4.Cook beans- put beans in pot and add in enough water to just cover beans. Bring to boil then lower hit to simmer and cook about 1 hour. Remove beans from liquid and set aside. Add in lard (if using) and cook down liquid, aka potlikker, until you have about 3/4 cup. Add beans back in, toss with potlikker and salt to taste. The Taste- It is hard to say enough about the transformation that occurs and how so much flavor can be developed from this drying process. The flavor is so rich and deep and satisfying. The Process- So, you need a bit of patience here. For most of us, gone are the days when this kind of preservation method was necessary not to starve come Winter. I do not sew, and I am not especially coordinated, but once I got a rhythm going with the stringing of the beans it was relatively quick and easy. What a cool idea! I’ll have to try this. Your picture of the beans shows they are still not dry. Do not think weeks, think a couple of months and when beans are Brown. That’s the way they were done here in tennessee. Also you need to boil briefly and then change the water and then cook. Mom n Gramma would dry them on Screens in the sun. They would put another screen on top n flip them. Not as easy as it sounds. When it looked like rain the would bring inside . Pain in fanny. Dry until brown (these been were snapped not whole)… they were very dry n crispie. Cook w some kind of pork fat for hours, and salt. Delish ! a special occasion dish. Haven’t had in years,since they passed. People in NC mountains stored them up for winter. MEMORIES!!! Gone is the time of women and children sitting around together and snapping beans and stringing them. This was a time of story telling and sharing thoughts and memories too.I still fondly have my own memories! A pot of green beans (especially if seasoned with smoked pork and onion-then potatoes added at the end) are already one of my favorite foods! I can’t wait to try leather britches! I have heard family talk of them when I was young, but no one ever made them when I was around. Can hardly wait to try Leather Britches with our fall beans! Porch snappin’ beans with my 91 yr old Mom is a blessing my family enjoys! Thanks for this.